Chowpatti is a beautiful Beach with Golden Sand. Visit it for its scenic beauty. Unique Mumbai Festivals (Ganesh Chaturthi, Ram Leela, Dasera, etc) are celebrated at the beach. 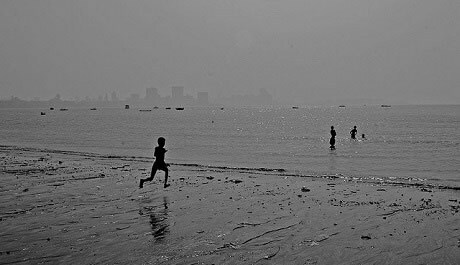 Chowpatty is one of few places for water sports in Mumbai. Ganesh Chaturthi: The biggest Ganpati Mandals in South and Central Mumbai come to Chowpatty Beach for “Visarjan” (placing the Ganesh Idol in the Sea). The celebration in Mumbai of the 10 day Ganesh festival, which usually takes place in September, is world famous. It is 10 days of street festivities in Mumbai. Ram Leela & Dassera: For 10 days, Ram Leela is staged at the Girgaum Chowpatty. This festival culminates in the burning of a statue of the 10 headed Ravan. Festival is in late September, early October. Although one can swim and bathe in the sea, there are no changing rooms or showers. Practically no one is seen on the beach in swim wear and it is not used as a typical leisure beach. Very few people take a dip in the sea. Day time can be very hot, especially in Summer. Visit either in the morning or after 5:00 pm in the evening. On weekends the beach gets crowded. Take a refreshing walk along the stunning Marine Drive Promenade which leads to Chowpatty beach. Saifee Hospital: This Majestic hospital, outside Charni Road station (East), has strong Islamic influence in its architecture. This is a Mumbai landmark. ISKCON and Babulnath Temples: Famous Hindu temples at Babulnath. Open to all. Cricket Maidans: Catch a game of cricket at the 5 cricket grounds along Marine Drive. Art Deco Buildings of Marine Drive: Marine Drive is home to among the largest collection of Art Deco Buildings in the World. Mani Bhavan: Mahatma Gandhi used to stay here when he visited Bombay. It is now a museum for Mahatma Gandhi. Mumbai’s Hanging Gardens: Walking distance from Chowpaty via a short cut. Open throughout the day. Food stalls close around 11:00 pm at night. South Mumbai, near Marine Drive. Train: The closest Mumbai Suburban Train Station is Charni Road (50 m) on the Western Railway Line. Bus: Many public transport buses to Chowpatty, Charni Road and Opera House.